Save yourself time and money with PulseTech's Xtreme Charge Parallel. If you own an 18-wheeler, diesel pick-up, or even a large generator, you're familiar with the hassle of charging two parallel-connected batteries. You either need to buy two chargers, or spend twice as long charging them with one, right? Wrong! The XC-PARALLEL is designed especially to charge 12V lead-acid batteries connected in parallel. You don't even need to select a particular battery type or charge rate, because the microprocessor controlled XC-PARALLEL automatically adjusts to provide whatever charge rate your batteries need. Xtreme Charge Parallel works on any type of 12-Volt lead acid VRLA, AGM or flooded battery. Proprietary algorithms combined with microprocessor controlled technology measure the battery's voltage and current to automatically determine and deliver the precise charge rate based on the size and condition of the individual battery, both initially and continuously throughout the five-stage charge process. Xtreme Charge is more than a battery charger and maintainer. 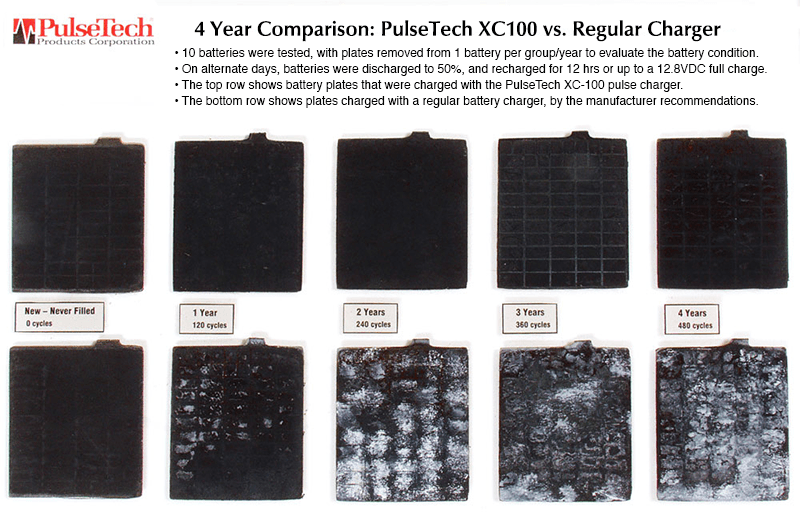 During the maintenance cycle, PulseTech's patented, optimized frequency pulsing constantly works to minimize and reduce naturally occurring battery sulfation, the main cause of battery failures. The quick disconnect feature allows you to permanently attach lugs to the battery and easily switch between lugs and clamps. The status light column shows you when the unit power is on, pulsing and charging. The battery light column indicates the percentage of the battery's state of charge: 25%, 50%, 75% or 100%.